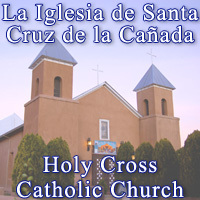 Holy Cross Catholic School is located in the community of Santa Cruz, NM, within the Española Valley. The Sons of the Holy Family priests officially opened the school in 1949, and the Dominican Sisters from Grand Rapids, Michigan, provided staffing. Its campus consists of the historic Santa Cruz de la Cañada Church, three elementary school buildings, a cafeteria (Marian Hall), a gymnasium, and three separate playgrounds. There are seven parishes that feed into HCCS. The school maintains a Catholic Christian atmosphere under the protection of the Holy Family of Nazareth, St. Dominic, and St. Joseph Manyanet. Students can learn by example the intellectual and spiritual virtues that will prepare them to be positive contributors in society. HCCS is home to approximately 70 students in pre-kindergarten through sixth grade. Most of the children have attended our campus since pre-kindergarten. They often have siblings enrolled at the same campus and have parents who also attended HCCS. Elements of faith are woven into the learning process by making religion an integral part of the daily curriculum. The school day begins with prayer and ends with prayer. We encourage students to incorporate their knowledge of faith into their everyday lives. There are tangible reminders of their faith in classrooms and throughout the school in the form of bulletin boards, pictures, statues, and prayer centers. Our teachers integrate faith in all school subjects - especially through writing, reading, art, and music. HCCS provides students with opportunities for worship through daily prayers. Students attend Mass every Friday morning at 8:30 a.m. Classes take turns hosting the children’s liturgy on Friday. They read the readings, carry the gifts and lead the music. There are many liturgical celebrations: the May Crowning, the Blessing of the school, the Goodbye to the Alleluia, Holy Thursday and the Washing of the Feet, Advent, and Lent, to name only a few. Our school community comes together to celebrate religious holidays and liturgies such as Christmas and the annual Christmas play. HCCS finds its center in the life and teachings of Jesus Christ. We strive to inspire our students, as followers of Jesus, to practice and live out the Gospel message; to live as Jesus lived. We give each student numerous opportunities to grow in faith and knowledge through prayer, Mass, and the study of scripture. Our students grow to understand that the Gospel must be a part of their daily lives. All HCCS students are called to reach out to and recognize the needs of others by sharing their gifts, talents, and time. Under the leadership of the school’s staff, the administration, and the pastor, we provide our students frequent opportunities for service to the school and community. These groups of individuals oversee many school-wide projects directed toward service and service learning. Some of these projects include Thanksgiving food baskets which are given to the poor in the Española Valley, donations to St. Vincent De Paul, St. Jude’s Math-A-Thon, The Rice Bowl, visits to the local nursing home to visit with the elderly, hosting a monthly luncheon for the Española’s senior citizens, and collecting money for relief efforts during natural disasters. With their involvement in the activities noted above comes a sense of personal worth and allows the children to grow in their faith. Nurturing spiritual and social goals are as important as academic and intellectual goals. The students are called upon to show support and respect for one another as we offer opportunities to build a sense of community internally through several avenues. We involve our PreK-6 students in school family activities throughout the year. We "pair up" our children in the fifth and sixth grades with children in Pre K and Kindergarten, thus becoming a “big brother” or “big sister.” They sit together during the Children’s liturgies on Fridays, and the older children are often invited to special classroom celebrations. There is a definite sense of community externally as well. HCCS proudly boasts of a 95%-100% parent participation percentage during its school events. For example, parent-teacher conferences almost always attract 100% of the parents. Open House (Welcome Back Evening), Grandparent Day, and Lenten activities, such as the sharing of a Lenten meal with parents, attract 90% to 98% parent participation. Other events that involve a high percentage of parent participation are the school’s annual fundraising activities such as the Fall Festival, the chocolate candy sale, the rummage sale, and the Parish Fiesta. There are opportunities for students to build community in the parish. Children in third grade participate in the First Eucharist and Reconciliation preparation. Our classroom teachers prepare our children for this special event in their lives. Many of our children are altar servers and serve not only during the children’s Friday liturgies but during other Masses and funeral services as well. Although we have a small percentage of students who are not members of our parish, most of our children attend Mass at their parishes on Sundays with their families. Students have learned the importance that being united as a community with the parish is part of our goal to live as Jesus lived. HCCS has many partnerships with various organizations/businesses in the Española Valley. These partnerships include the Knights of Columbus, the Catholic Daughters, the Catholic Foundation, Los Alamos National Laboratories, Wal Mart, to name a few. We have community business members and parents who share their time and talents with our school for little, and many times no, financial compensation. We rely highly on these “in kind” contributions to keep our doors open and a Catholic education available to those who want one. We recognize that parents are the primary teachers of their children and realize that working collaboratively with parents strengthens their children’s faith life and religious education. We offer Bible study free of charge to all parents and members of the community at various times throughout the school year.